Give your fishcakes Japanese flavour by infusing baked salmon and mashed potato with miso paste and lime and serving with a wasabi mayo. 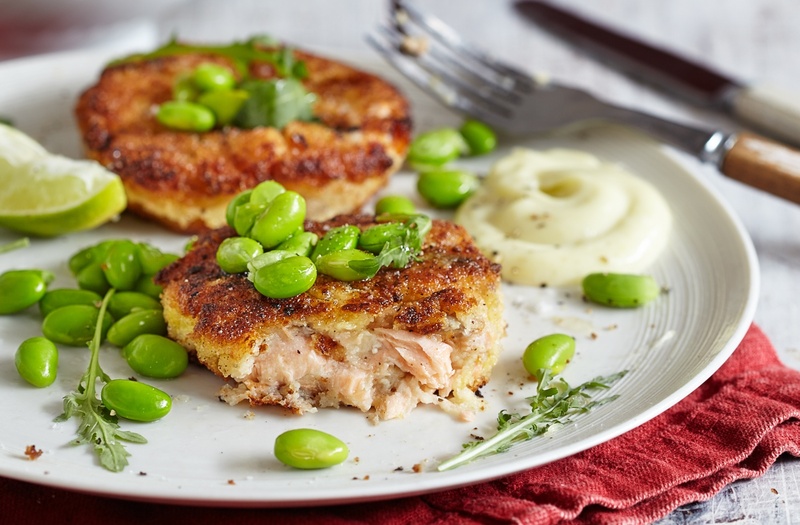 This salmon recipe is a midweek meal that's really easy to make and gives a tasty twist to classic fishcakes. Preheat the oven to gas 5, 190°C, fan 170°C. Wrap the salmon in oiled foil and put on a baking tray. Bake for 18 mins, or until just cooked. Remove from the oven and set aside. Heat the mash following the packet instructions. Spoon into a bowl and stir in the lime zest and juice and the miso paste. Flake in the salmon, combine, then divide the mixture into 8 and shape into patties. Put the flour, egg and breadcrumbs on separate plates. Dust each patty in the flour, dip in the egg, then turn to coat in the breadcrumbs. Heat the oil in a large frying pan over a medium heat. Fry the patties for 4-5 mins on each side, until crisp on the outside and hot all the way through. Meanwhile, in a small bowl, mix the mayonnaise with the wasabi; season to taste. Serve the fishcakes with the wasabi mayo, soya beans, lime wedges and a little rocket salad on the side. In order to enjoy optimum flavour and quality, frozen items are best used within 3 months of their freezing date.